The soundtrack doesn’t provide a cohesive or particularly pleasurable listening experience. 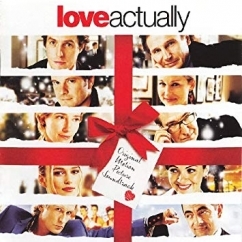 One of the few recent Christmas movies to grasp that holidays are both fantastically blissful and agonizingly sad, Love Actually is often disparaged for packing in so many characters and competing storylines. Nevertheless, fans recognize that it portrays a variety of holiday-adjacent experiences. Recently reissued on snowy white vinyl, the movie’s soundtrack taps into this diversity—for better and for worse. Joni Mitchell’s 2000 cover of her own “Both Sides Now,” featuring Vince’s Mendoza’s extravagant orchestral arrangement, movingly sums up the film’s themes: “I’ve looked at love from both sides now/ From give and take and still somehow/ It’s love’s illusions I recall/ I really don’t know love at all.” Mitchell’s smoky vocals emphasize her world-weariness and implicitly play up the song’s storied history, including Judy Collins’ recently ubiquitous take and Mitchell’s 1969 original. The soundtrack works best when it deploys covers to tap into a history of popular music marked by transcendent joys and heartrending tragedies. Another standout in this vein is Otis Redding’s “White Christmas,” first released in 1968 after his death. Filled with bitter longing, it uses a bluesy, “Unchained Melody” guitar riff to emphasize that the white Christmases of the title are long gone, a dreary loneliness left in their wake. Two of the sillier covers on the album are lovable reminders of comedic moments from the movie. Bill Nighy’s “Christmas Is All Around” is a holiday-inspired take on the Troggs that boasts deliberately corny backing vocals and obligatory sleigh bell percussion, and sounds exactly like the desperate attempt for radio play that it represents in the film. Olivia Olson’s “All I Want for Christmas Is You” doesn’t veer far from Mariah Carey’s original, but the repetition of “and you” near the song’s end provides a cheeky joke about popular (holiday) culture’s failed attempts to appeal to everyone. While the album’s covers are either moving or amusing, its non-covers are for the most part painful reminders of the state of popular music in the early ‘00s. For instance, the best one can say about Texas’ “I’ll See It Through” and The Calling’s “Wherever You Will Go” is that they’re equally fun to sing along to and scorn. Three selections from Craig Armstrong’s bombastic score are as pallid as the winter-white turtlenecks worn in the film, although they do provide a share of romantic warmth. The Beach Boys’ “God Only Knows” may be a reliable chestnut but seems tacked on for its liberal use of even more sleigh bell. Still, we can all be thankful that the filmmakers didn’t ask 3 Doors Down or Evanescence to cover it. While the different plot lines somehow work together in Love Actually, the movie, the soundtrack assortment doesn’t provide a cohesive or particularly pleasurable listening experience. This may be due in part to the album’s painfully accurate reflection of holiday ambivalence. But a more focused collection of songs to orbit around its classics would have reminded us more convincingly of holiday joys and pains.